9-1-1 for Kids� Goes to Washington D.C. The 2011 National 9-1-1 Education Month Kickoff Celebration will take place on Thursday, March 31, 2011 at the Russell Senate Building Garden on Capitol Hill from 10 a.m. to 12 p.m.
9-1-1 for Kids® and E9-1-1 Institute will host the National 9-1-1 Education Month Kickoff Celebration supported in part by a grant from State Farm. 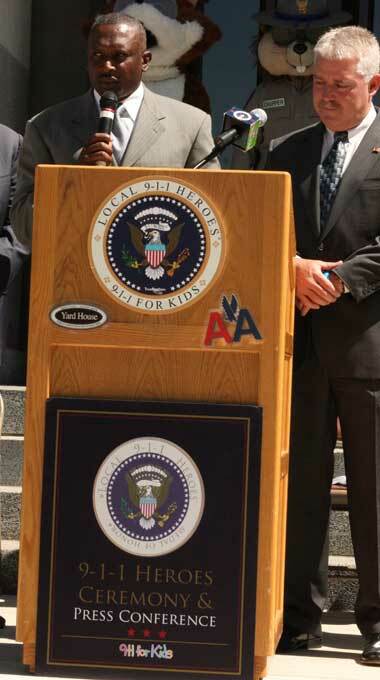 9-1-1 for Kids® International Chairman, Tim Brown, (former Oakland Raiders Captain and 1987 Heisman Trophy Recipient – Notre Dame) will serve as master of ceremonies. Mr. Brown will be joined by the Executive Director of E9-1-1 institute, Greg Rhode, the Executive Director of the National Emergency Numbers Association, Brian Fontes, in addition to other distinguished leadership from the National Education Association, the National 9-1-1 Education Coalition, and the NexGen 9-1-1 Caucaus (more to be announced). Joining the festivities are other 9-1-1 public safety officials, as well as local elementary schools and community-based youth organizations.